A lot has happened since Christmas, a whole new adventure with a new job and relocating to Wales. So, to be honest, playing board games has had to be put on the back burner. Now, that I’m settled, I made a trip to my local game shop in the centre of town (Rules of Play) and brought a copy of Ghostel. Ghostel is a dice rolling worker placement game for 2-4 players that plays in roughly 45-60 minutes. You play as ghosts scaring visitors away from a hotel that used to be YOUR haunted house! The creators of this dice rolling game is Gino Brancazio from Tinkerbot Games and Bevan Clatworthy. I remember seeing this at last years (2016) UK Games Expo and wanted to pick up a copy but alas, there were no copies available. As I said, this game reminds me of the old PC game called ‘Ghost Master’ where you were tasked as a master of ghosts where you were tasked with scaring people away from the house that you were haunting. I liked playing that game back in the day so based on those memories, I approached Ghostel with high hopes and expectations. This review is going to be slightly different, as my son was tasked with playing the game and then sharing his thoughts about it. To make it easier, I prepared some questions which he duly answered. Son – Ghostel is made by Tinkerbot Games. As mentioned above, Ghostel is published by Tinkerbot Games who are made up of Gino Brancazio, Bevan Clatworthy and Tony (too cool to have a last name). 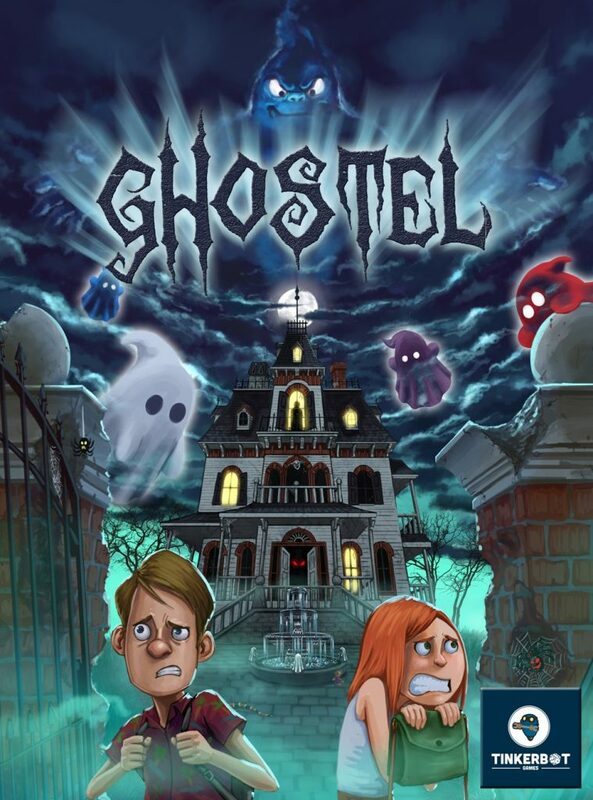 Ghostel was their first game, that raised 20,000 + via KickStarter. How many players is it for? Son – The number of people allowed to play are 2-4 players. It is worth noting that if there are only 2 players, then they have to control two ghosts each. So, in essence, the sweet spot for this game is three to four players. It is still fun with two players (so don’t let that deter you) but I’ve always been the player that likes to focus on one character at a time. It helps the immersion for me. If I had to control two ghosts, then it just feels like I’m moving pieces around the board. Son – To get as many points as you can by scaring people out of the house. To be fair, that is a pretty good explanation of the game – I can’t really expand more than that. Son – You choose a room that to put your ghost in a room with the coloured dice. You do this three times. When the board is laid out, there are nine spaces that represent the rooms that the guests will be staying in. So, at the start of the game, the guests populate these rooms. Each guest has a scare rating, and some of the guests have phobias. Each round has a night phase and a day phase. During the night phase, three dice are rolled and this represents the “scariness” ghost. The player then chooses which room to start their haunting. So, if the player rolls a 2 but the guest has a scare rating of 4, then the ghost has not succeeded in scaring the guest from the hotel. In order to scare the guest from the hotel, the dice placed within that room has to equal or exceed the scare rating of the guest. The process of placing the ghost in the rooms is repeated until all the dice has been placed by all the players. 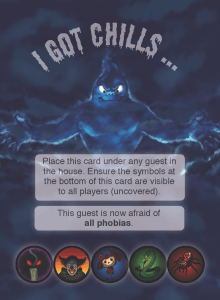 By the use of phobia cards, as long as the guest has the same phobia that is present on your scare tactic card, then that dice result is doubled. In the case of the example above, if ‘Joe’ the guest had a phobia of spiders and you had the right card to place, then the die result of 2 would be doubled to 4 and thus Joe would be scared from the hotel. It should also be noted that other ghosts can aid in scaring off the guests. When that happens, the ghost that had the higher dice result gets the points for first place, second highest contributor gets second place score and so on. Once, the ghosts moved and placed the dice, then the night phase ends and the day phase begins. 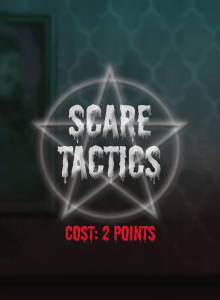 During this phase, the ghosts are removed from the board, the scoring is tallied and the players have the opportunity to buy cards that will help them in their quest to scare guests more effectively. The Day/Night phase is repeated until the house can no longer be fully populated by the start of the night phase. What do you think of the artwork? Son – I think the games art work is great. I like how it looks very cartoon like and I like how scared the guests look. The cards do have a good artwork, for me, the cards do have a light horror feel and the way the guests are depicted as scared is humorous. It was a nice touch of the designers to have a pledge level in their Kickstarter that allowed pledgers of a certain level to have their likeness in the game. Son – The player tokens are ok, I liked being the red ghost. The player tokens are in the shape of a ghost. The ghost tokens are very thick and heavy to hold. That is not a bad thing as they remain on the board and give a real physical presence to the board. When you look at the board, you can easily see the state of the board. I was very impressed on how well they are made and feel. When the token hits the table or floor, there is a definite clatter and you have no worry about the ghost token breaking. Son – I think the cards and special powers are great. 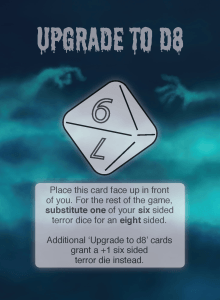 and I do like the cards, especially the card that allows you to upgrade to a D8. I do think that there should be a card that takes away a dice or reduce a dice from someone else. There are various cards that are available. There are Scare Tactic cards that show different phobias that can be applied to the relevant guests. 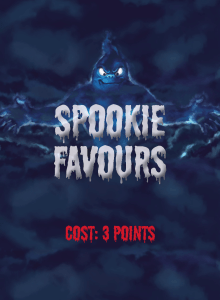 Spookie Favour cards give the ghosts bonus such as being able to move around the board to a different location without having to follow the one room per room move. 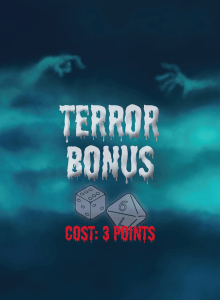 Terror Bonus cards help the ghosts scare in a more efficient manner (usually in the form of more dice to choose from). Note, that buying cards reduces your score by the cost of the card. 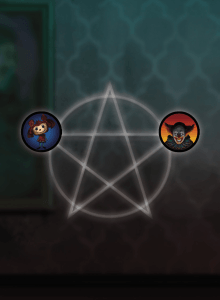 So you have to balance your score vs whether you want to buy cards to aid the ghosts. Son – There is nothing that I do not like. It’s a very well made game. No argument from me on this. Son – There was lots of talking about how to scare the people in the hotel. Although this is a game where you play against each other. We played with the cards on the table so that everyone can see what powers we had (You’re supposed to keep them to yourself). I feel that this didn’t distract from the overall playing experience and thus it enabled us as a family to communicate with each other and have fun doing so. With some powers that could potentially block other ghosts or make things harder, there could be an element of ‘take that’ but that is not the focus of the game. So depending on who is playing, you can adapt the game to suit your needs. Have you played any game that is similar to this? Son – I’ve never played any game like this that was fun or pretending to be a ghost. While there are other games that deal with spirits and ghosts such as Ghost Stories, and the PC ‘Ghost Master’ game from the 90/00’s. This is the first time that I’ve played a game like Ghostel. Would you play again or would you leave this on the shelf? Son – I like this game and have played it at least 5 times since we brought it a couple of weeks ago. As a parent, it is always good to play games with the family and it is a testament to this game on how well it has engaged the family. Since I brought it at the start of May, we have played it several times a week. Sometimes, more than once in the same evening/night. Son – I would recommend it to my friends, they would love that you can scare people as a ghost. As someone that has introduced games to non board gaming people, this would be in my collection to introduce to them after the “starter” games (e.g. Fluxx). It has enough competition to engage people and the rules are simple to understand and follow. So, for me, this makes a good gateway game that will whet people’s appetite. It also does not take too long to play. There are various strategies that a player can utilise. If they find that their rolls are not in their favour, then they can buy phobia cards that double their score to make scaring easier. One aspect that we had to remind my son was that it wasn’t always best to go for cards that had the big numbers, especially when you consider the other cards that are on the board. We tried to teach him (he got it in the end), that it’s worth going for three 5 point cards rather than the one 12. 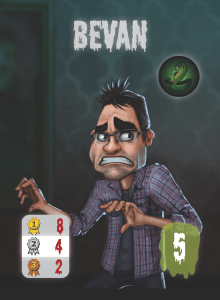 There are also some cards that block the other ghosts from entering the room, so you could try those tactics to prevent people from moving around the board. It should also be noted that there were numerous times when I was in last place by a significant margin. However, it is possible by clever haunting to close the gap and effectively take the lead. The game seems balanced even though at times, you may wonder how you’ll catch up. I’m not one for ratings as it can be subjective. Theme is wholesome and not to scary for little ones. Easy enough for them to learn and want to beat you at it. There choices are deep and rich enough to keep you engaged. It can be seen as a game that is roll dice, move, play cards, place dice..rinse and repeat. Does it tell a story such as Robinson Crusoe, does it have tension like Pandemic or Ghost Stories, is it pushing the boundaries of taste such as Cards of Humanity. No, it doesn’t but what it does do is to be a game that is good for a family/people to bring out and have good wholesome fun. I can imagine bringing this out at a BBQ when everyone is relaxing, I can imagine intorducing this at a board game lunch with work colleagues whose exposure to rolling dice is Monolopy or Game of Life. So for me, Ghostel is one for the collection. Posted in Dice Rolling, Review and tagged Ghostel, Review, Tinkerbot Games. Bookmark the permalink.